Today some 50 million Elderly Americans are being cared for at home by family members, who often need help, but cannot find reliable resources. Many others, particularly seniors, would prefer to stay at home as they become less able to care for themselves, but lack family close by or able to help them on a daily basis (7 million seniors live more than 100 miles from family). These numbers are expected to increase rapidly over the next twenty years or so as the Baby Boom generation ages. 10,000 people a day are turning 65! To meet this burgeoning need, a home care industry – medical and non-medical – is rapidly developing. 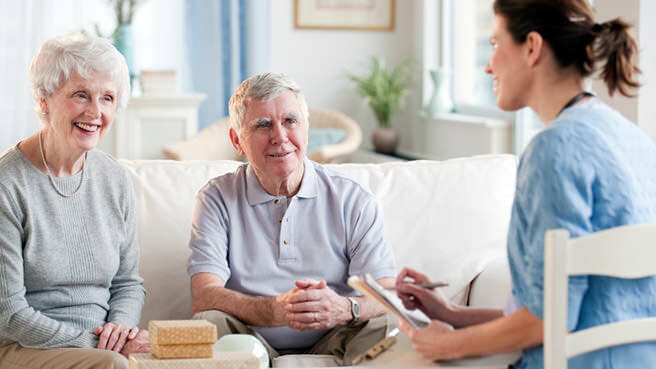 For many of the people who do not require skilled nursing care or want their family members caring for them, the best option is a non-medical home care service. These services provide companionship and/or help with daily activities such as bathing, driving, nutritious meal preparation, medication reminders, dressing and grooming assistance — from a few hours per day to 24/7. For many seeking their place in the industry, the choice is the model offered by At Home Eldercare, a franchise organization founded by Gavin Densmore. Densmore’s staff has over 45 years experience in the non-medical home care business; and through a previous company, Home Care Seminar, has trained 100's of agencies over the past 10 years. As the founder of Helping Hands of America, based in Raleigh, North Carolina, and Raleigh's oldest home care agency, Densmore recognized the local nature of the business and had a deep understanding of its complexities and what it takes to be successful in the in-home senior care market. Franchisees can take advantage of discounted and well-vetted industry services, including scheduling software, personnel background checking, liability insurance and others. Franchisees receive ongoing education on emerging industry trends at periodic meetings and can call upon the experience and learning of not only the At Home Eldercare’s professional staff, but also their fellow Franchisees. “Our Franchisees come from widely varying backgrounds, many with no prior experience in the healthcare industry, but all share a desire to help aging seniors, a key quality for doing well in this business,” said Densmore. “We’re invested in our Franchisees’ success and are fortunate to work each day with this highly motivated group. In addition, it’s gratifying to know we’re meeting an important need in our society to help our seniors remain independent.” Densmore sees this need for well-run, local home care businesses growing into the foreseeable future, all across the nation, and around the world. We’re invested in our Franchisees’ success and are fortunate to work each day with this highly motivated group. Franchisees have come from the corporate world, real estate, medical, mortgage and many other earlier careers — all seeking to operate a business that is emotionally as well as financially satisfying. A number have entered the business after being unable to find quality services in their local markets when their own families had need of home care services. All Franchisees take part in At Home Eldercare’s comprehensive initial training program to learn the basics of the business and to begin forging relationships with At Home Eldercare professional staff and other Franchisees. Most are up and running within a month or so of the training. At Home Eldercare conducts training for new Franchisees throughout the year. Gavin Densmore is a noted industry speaker and has served on the board of the Alzheimer's Association, as well as having been interviewed by the Raleigh News & Observer and the Zebulon Record. What do we live for if not to make life less difficult for each other? Customized Plan of Care by an R.N.